The Basement Doctor of Cincinnati provides PolyLevel concrete lifting and leveling services throughout the greater Cincinnati area. If you've noticed sinking walkways or sidewalks near your home, call Perma-Seal today! They are a PolyLevel dealer than can lift and stabilize your sinking concrete. TFS provides expert concrete lifting, concrete leveling, and concrete repair services with PolyLevel. They can solve your concrete problems in Tennessee, Kentucky and Southern Indiana quickly and effectively. 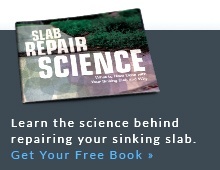 Do you have sinking, cracked concrete around your property? The Basement Doctor - Lima provides reliable concrete leveling, concrete crack repair, and concrete sealing solutions in IN and OH, including Fort Wayne, Lima, Warsaw, and areas nearby. Contact them today to schedule a free estimate on any of their reliable concrete repair solutions! Master Service Companies is your local PolyLevel dealer offering concrete leveling throughout Indianapolis and nearby in Indiana. Conditions where outdoor concrete has already begun to sink is not uncommon in Indiana and is often the result of shifting or a weak soil base or erosion. It causes driveways, sidewalks, walkways, concrete steps or patio areas to become tripping hazards and can effect property value. Indiana, also known as The Hoosier State, hosts a variety of soil types, ranging in density and load-bearing capacities. Mostly flat with some rolling hills, Indiana soil primarily consists of glacial sands, gravel and clay, which is great for farmland. Today, select contractors in Indiana are trained and to provide a better alternative to mud jacking. PolyLevel is a less intrusive, lighter weight solution that doesn't add more weight to the problem. If you are seeing signs of sinking concrete on your property, have a contractor to provide the PolyLevel alternative to mud jacking take a look at it. 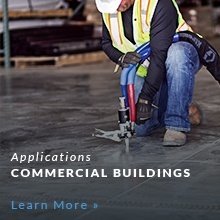 The following Indiana contractors are trained and to provide a free estimate to solve your sinking concrete problem. "Very professional from our initial contact all the way through the actual..."
My driveway sunk 2 inches at the garage slab and 3 inches at the street. I just want it restored. I have a slab that has settled about an inch causing water coming off the lawn to pool rather than flow off the driveway. This is causing a backup of water by my garage service entrance door. I can supply photos. One front corner of my garage door has cracked and sunk. Getting a new garage door in a few weeks. We built a pool house 10 years ago. It was built like a pole barn and then the concrete slab was poured inside and around it. One corner has settled 1-1.5 inches and is a trip hazard. Can you help? Steps have separated on front of house. We have found about a 2-foot tunnel like void under the concrete slab in the crawl space. Can only be accessed via the basement. Wondering if polylevel might be a solution. I have a set of concrete steps at my back door that have sunk 8-10". Previous owners built wood steps to cover, but I'd like to investigate the option of lifting the old steps. One section of sidewalk coming to the front door has dropped about 1 1/2 inches from the other sections. Have a sinking spot in my garage that is allowing rain runoff to flow into the garage, and a gap under the garage door on the left side. I have a 14' by 18' concrete patio that has settled several inches from its original location and I would like to get an estimate to lift this back. Raised concrete patio cracked and sinking. It is leaving a hole between the house and the patio letting in water to the basement. Not sure if it would be better to demo the patio and replace or polyjack it. The front step and sidewalk are sinking as well. Do you do work in Indiana? I have a step that needs to be lifted at my home. Thx. I am in need of an estimate of my carport and side walk that is falling badly! Carport is about 21x24.. I am located in Paoli, IN, about an hour south of Bloomington. Would it best if I send photos to see if it's possible to fix?? And get a rough estimate? Thanks!! I have a section of my driveway that has sunken and needs to be raised. There is another area that is starting to sink as well, I'm looking for a quote to do this repair. I would be happy to send a pic if you would like to get a better idea of the problem. I have a roughly 5x7' section of concrete patio next to the house which is cracked from the larger piece and is sagging. Have a small concrete stoop on the back of the house that slopes toward the house. Came up on a home inspection. Looking to have fixed. My concrete (stampted) for the patio has settled and my steps are tilted. I also have a long concrete drive with some areas that need attention. Driveway has 1 saw mark in the middle horizontal to the house. The lower part is sinking and they did not saw a vertical line down the middle so it is cracking there. But the lower part has sunk around 3 inches and rather than replace can this section be leveled? We have 2 steps that are sinking to our front porch! Front porch slab settled so water runs toward the house. We have a detached, single car garage that has a corner that has settled about 2-3 inches. I would like more information to see if this is an option to repair the settled slab. I have 2 areas, #1 is front slab between my driveway and front porch and #2 is a porch slab in my backyard. Also have a few areas on the walkway around my in ground pool. The 6' x 6" front porch slab has sunk about 1.5" next to the house. I want the slab raised back to it's as built height to restore the original slope. I have a Large pool Deck with multiple trip hazards and need concrete slabs leveled. Comment: My driveway sunk 2 inches at the garage slab and 3 inches at the street. I just want it restored. Comment: I have a slab that has settled about an inch causing water coming off the lawn to pool rather than flow off the driveway. This is causing a backup of water by my garage service entrance door. I can supply photos. Comment: One front corner of my garage door has cracked and sunk. Getting a new garage door in a few weeks. Comment: We built a pool house 10 years ago. It was built like a pole barn and then the concrete slab was poured inside and around it. One corner has settled 1-1.5 inches and is a trip hazard. Can you help? Comment: Steps have separated on front of house. Comment: We have found about a 2-foot tunnel like void under the concrete slab in the crawl space. Can only be accessed via the basement. Wondering if polylevel might be a solution. Comment: I have a set of concrete steps at my back door that have sunk 8-10". Previous owners built wood steps to cover, but I'd like to investigate the option of lifting the old steps. Comment: One section of sidewalk coming to the front door has dropped about 1 1/2 inches from the other sections. Comment: Have a sinking spot in my garage that is allowing rain runoff to flow into the garage, and a gap under the garage door on the left side. Comment: I have a 14' by 18' concrete patio that has settled several inches from its original location and I would like to get an estimate to lift this back.